64A Cry for today, and a hint to the starts of 17-, 25-, 37- and 54-Across : APRIL FOOL! The Inca people emerged as a tribe around the 12th century, in what today is southern Peru. The Incas developed a vast empire over the next 300 years, extending along most of the western side of South America. The Empire fell to the Spanish, finally dissolving in 1572 with the execution of Tupac Amaru, the last Incan Emperor. The origins of our word “jalopy” meaning “dilapidated old motor car” seem to have been lost in time, but the word has been around since the 1920s. One credible suggestion is that it comes from Xalapa, Mexico as the Xalapa scrap yards were the destination for many discarded American automobiles. The term “adiós” is Spanish for “goodbye”. “Adiós” comes from the phrase “a Dios vos acomiendo” meaning “I commend you to God”. “North by Northwest” is a marvelous 1959 Hitchcock film starring Cary Grant, Eva Marie Saint and James Mason. After the release of the movie, Hitchcock stated that he had envisioned Cary Grant’s character hiding from the villains on Mount Rushmore, in Abraham Lincoln’s nose. He also suggested the film might have had the title “The Man in Lincoln’s Nose”. MCI was a giant telecom company that suffered a similar fate to Enron, and around about the same time. MCI’s stock price fell in 2000 and in maneuvers designed to protect the price, the company committed illegal acts. The larger-than-life CEO back then, Bernie Ebbers, is now serving a 25-year sentence in Louisiana. If you’re in Australia or New Zealand and looking for a rib eye steak, you need to order a “Scotch fillet”. In the game of golf, a “tee” is a wooden or plastic peg on which one can place a ball when “teeing off”. Also, the “teeing ground” (sometimes “tee” or “tee box”) is the area at the beginning of the hole from which the first stroke is taken, from where one tees off. An entente cordiale (sometimes just “entente”) is a friendly understanding, usually between two nations. The term, which translates from French as “cordial agreement”, was first used to describe a set of agreements between the UK and France that were put in place 1904. The Poetic Edda and Prose Edda are two ancient works that are the source for much of Norse mythology. Both Eddas were written in the 13th century in Iceland. The McMuffin breakfast sandwich was introduced, without the knowledge of the corporate office, by the operator of a Santa Barbara, California franchise in 1972. Back then, McDonald’s only offered food for lunch and dinner. The initial reaction of the corporate office on hearing about the McMuffin was to reprimand the Santa Barbara franchise operator, before embracing the concept. Peter Yates was an English film director and producer. His first film as a director is very well known by folks back in my part of the world. Released in 1963, the film “Summer Holiday” is a very lightweight vehicle for the singer Cliff Richard. Over in the US Yates is better remembered for directing the likes of “Bullitt” (1968), “Breaking Away” (1979) and “The Deep” (1977). “The Deep” is novel by Peter Benchley (who also wrote “Jaws”). “The Deep” was adapted into a 1977 film starring Robert Shaw, Nick Nolte and Jacqueline Bisset. In the “Peanuts” comic strip by Charles M. Schulz, the protagonist Charlie Brown has a younger sister Sally Brown. Sally is the dominant person in the sibling relationship, and frequently persuades Charlie to do her homework. An epithet is a word or phrase used in a name to describe a quality of the person or thing bearing that name. For example, King Richard I was also known as Richard the Lionheart. The term “epithet” can also describe a word that is disparaging or abusive. Josh Duhamel is a former fashion model who won a 1997 International Modeling and Talent Association competition in 1997, beating future acting star Ashton Kutcher into second place. Duhamel transitioned into acting starting with the role of Leo du Pres in the daytime soap “All My Children” in 1999. He married the singer Fergie in 2009, although they separated in 2017. “Love, Simon” is a 2018 teen comedy-drama that is based on a 2015 novel called “Simon vs. the Homo Sapiens Agenda” by Becky Albertalli. The film is noted as the first mainstream Hollywood film to focus on gay teenage romance. The inventor Eli Whitney is a best known for inventing the cotton gin. Whitney also came up with the important concept of “interchangeable parts”. Parts that are interchangeable can be swapped out of equipment or perhaps used in related designs. A cobblestone is a stone of a particular size that is used as a building material, and a material used in paving in particular. There is a scale that defines a “cobble” as a stone that’s larger than a pebble and smaller than a boulder, and more precisely measures between 2.5 and 10.1 inches. 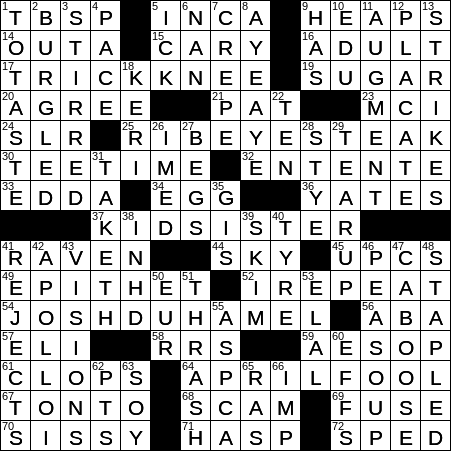 64 Cry for today, and a hint to the starts of 17-, 25-, 37- and 54-Across : APRIL FOOL! April Fools’ Day is celebrated on April 1st in the western world. In the US (and Ireland) one can make practical jokes all day long if one wants. But in the UK there is a noon deadline. Anyone pranking after midday is called an “April Fool”. In the television version of “The Lone Ranger”, Tonto was played by the actor Jay Silverheels. In the terrible 1981 movie “The Legend of the Lone Ranger”, Tonto was played by Michael Horse. In the 2013 movie “The Lone Ranger”, Tonto was played by Johnny Depp. Famously, the Lone Ranger’s horse was called Silver and Tonto’s mount was named Scout. But, in the early TV shows, Tonto rode a horse called White Feller. “The Lone Ranger” was both a radio and television show that dated back to its first radio performance in 1933 on a Detroit station. The line “Hi-yo, Silver! Away!” was a device used in the storyline to signal that a riding sequence was starting; so cue the music! Actress Sissy Spacek got her big break in movies when she played the title role in the 1976 horror movie “Carrie”, which is based on the Stephen King novel. Her most acclaimed role is the lead in the 1980 biopic about Loretta Lynn called “Coal MIner’s Daughter”, for which she won an Oscar. Spacek’s first cousin is the actor Rip Torn. The crime of burglary is the breaking into and entering of a building with the intent to steal. The actual theft itself is a separate crime. “Crêpe” is the French word for “pancake”. In bowling, a spare is recorded on a score sheet with a forward slash mark. A strike is recorded with a large letter X. The TV drama “Felicity” stars Keri Russell in the title role as Felicity Porter, and ran from 1998 to 2002. Felicity is a student at the fictional University of New York (UNY), which is based on the real New York University (NYU). Apparently, NYU refused the show’s producers permission to use the “NYU” name. The initials “GI” stand for “Government Issue”, and not “General Infantry” as is widely believed. “GI” was first used in the military to denote equipment made from Galvanized Iron and during WWI, incoming German shells were nicknamed “GI cans”. Soon after, the term GI came to be associated with “Government Issue” and eventually became an adjective to describe anything associated with the Army. The United Service Organization (USO) was founded in 1941 at the request of President Franklin D. Roosevelt “to handle the on-leave recreation of the men in the armed forces”. A USO tour is undertaken by a troupe of entertainers, many of whom are big-name celebrities. A USO tour usually includes troop locations in combat zones. The fatty component of milk is known as butterfat (sometimes “milkfat”). To be labeled whole milk, the butterfat content must be at least 3.25%. Low-fat milk is defined as milk containing 0.5-2% fat, with levels of 1% and 2% commonly found on grocery store shelves. Skim milk must contain less than 0.5% fat, and typically contains 0.1%. Here’s another example of terms that change as we cross the Atlantic Ocean. When talking about tires (“tyres” in Britain and Ireland), a defect can cause a “flat” (“puncture” in Britain and Ireland). Apollo 1 was planned to be the first manned mission in NASA’s lunar landing program. Sadly, the three crew members perished in a tragic cabin fire that took place in a launch pad test. The astronauts who died were Gus Grissom (the second American to fly in space), Edward White (the first American to walk in space) and Roger Chaffee (the pilot for the planned Apollo 1 mission). The poem “A Visit from St. Nicholas” was published anonymously in 1823, and is better known today by its first line “‘Twas the night before Christmas”. Most scholars believe that the poem was written by Clement Clarke Moore, a theologian from New York City. Others say that it was written by Henry Livingston, Jr., a poet from Upstate New York. The word “caboose” originally came from Middle Dutch and was the word for a ship’s galley. When the last car in a train in North America was given a stove for the comfort of the crew, it took on the name “caboose”. The term has also become slang for a person’s backside. Swingline is a manufacturer of office staplers and hole punchers. Founded in New York City in 1925 as Parrot Speed Fastener, the company invented the world’s first top-opening stapler that allowed for easy loading of staples. That creative design of stapler was called the “Swingline”, which was the name eventually adopted by the whole enterprise. The full name of Israel’s second largest city is Tel Aviv-Yafo. “Tel Aviv” translates into “Spring Mound”, and is a name that was chosen in 1910. In the alphabet, the F (eff) is before the letter G (gee). The quart, the unit of volume, is so called because it is one quarter of a gallon. A resident assistant or resident adviser (RA) is a peer leader found in a residence hall, particularly on a college campus.